Wanting your business or wanting your money? And giving a damn. Think about the title of this damn blog post. Ask yourself? Do you want to hire a contractor that wants your business or one who wants your money? There is a damn big difference! ( I can cuss…its my blog) Here is the fundamental difference. has a great damn “price”. Usually lowest bidder. Remember, they just want the money. The easiest way to get your hands on it is to be the cheapest right? isn’t on time and is hard to get a hold of….why do they care about you? They have your $ Damn them. Puts out damn crappy work. Cut everything they can from the job so they could put more $ in their pocket and get down the road. smiles, tells you the truth. What is and isn’t possible given the given situation. Why would anyone set unreasonable expectations….I see contractors do it all the damn time. Puts out top quality work that was learned through giving a damn about what you do. We put all of our knowledge and experience into jobs, and attend seminars and workshops to learn even more. Oh and guess what if we have a question about something we call our supplier. They answer our questions because we buy a boat load of product from them….and they give a damn too! I bet I spend a good 20% of my work week talking with suppliers, reading trade magazines, and blogs, and just doing over all research to find better products and methods to provide for our customers. I bet my competition doesn’t spend more than 1 day a year on average trying to better themselves. Thats a damn shame to hire someone like that. Sorry if I cussed too much on this post. KU just lost and is now out of the tournament because they didn’t look like they gave a damn until it was too late….which is exactly what I don’t want to happen to you. So if you give a damn. I want your damn business. 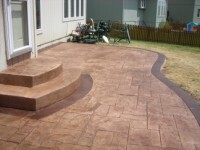 This blog is intended to talk about concrete issues, new products, and more in the Kansas City metro.